Double sided rayon blood chit, approx. 24 x 19cm. Printed in red, blue and black ink on a single piece of rayon. For use by American aircrews flying missions over Soviet controlled regions. Printed to the front with a large Stars and Stripes flag plus wording in Russian asking that the holders details be passed to the American Military Mission in Moscow. The reverse side has a smaller flag and similar information along with detailed instructions for use. Unhemmed edges. Superb clean condition. Folded in order to to be placed in the extremely rare plastic acetate pouch/sleeve (approx. 11 x 13cm) designed to hold the blood chit such that the allied flag could easily be seen. This has a rubberized fabric 'tongue' with a cotton neck tape attached. The pouch could also be attached over a service dress or battledress button. The scarce chit is in excellent condition. The pouch remains quite clear but has warped a little at the folded edges and has a small spilt at the top edge (see photographs). The fabric tongue is worn at the rear. 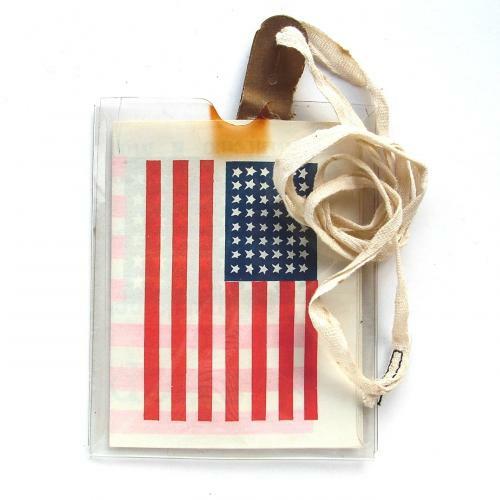 A vital safety 'pass' for American airmen and a very nice survival item. Stock code S21252.